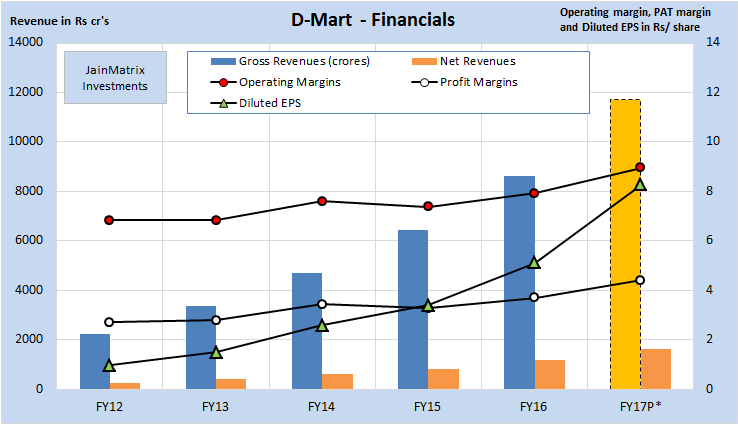 Overview: D-Mart is an emerging national supermarket chain, with a focus on value retailing. Total income for FY16 was Rs 8,606 cr. and net profit Rs 319 cr. Its revenues, EBITDA and PAT have grown at 40.3%, 45.5% and 51.6% resp. CAGR over 5 yrs. It has 118 stores with total retailing area of 35.9 lakh sq.ft. It has a low employee count and uses contract staff to contain costs. 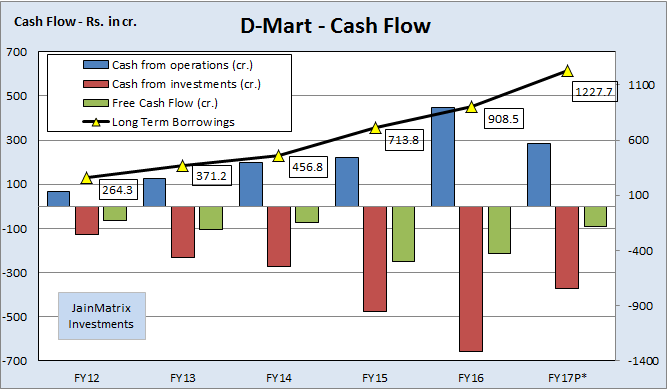 Operations: D-Mart has a cluster based growth strategy which has allowed it to extend reach in areas where it has a presence. The store expansion strategy and cost control techniques are good. D-Mart has a professional management team, a respected promoter and clear vision and growth strategies which are likely to keep the company on the successful path. At a current P/E of 39.9, the asking price is fair, considering that DMT is the leader in its segment. Most good IPOs get oversubscribed and few applicants get share allotments. Subscribe to JainMatrix Investments to get their pre-listing IPO notes, and invest successfully. Here is a note on Avenue Supermarts Ltd. (DMT) IPO. This IPO opens: 8-10th Mar 2017 with the Price band: Rs.295-299 per share. Shares offered to public number 6.25 cr. The FV of each is Rs. 10 and market Lot is 50. These shares are 10.02% of equity. The IPO will collect Rs 1,870 cr. with a fresh issue of shares. DMT was incorporated in the year 2000 by Mr. Radhakishan Damani. He is also a well known Stock market Investor, Stockbroker and a Trader. He owns 43.8% in DMT while his investment vehicle Bright Star owns another 15.8%. His brother and several family trusts own the remaining shares. The promoter group holds 91.36% stake, which will fall to 82.2% post-IPO. DMT will benefit from the fresh issue of shares as the proceeds will go the company. Utilization of IPO proceeds: Repayment of loans / redemption of NCDs Rs. 1,080 cr., construction and new stores Rs. 366.6 cr., and general corporate purposes Rs. 423.4 cr. DMT is an emerging national supermarket chain, with a focus on value-retailing. Revenue in FY16 was Rs. 8,606 cr. and profit Rs. 319 cr. It has 4,738 full time employees. According to Technopak, DMT was among the larger and more profitable Food and Grocery (F&G) retailer in India in FY16. DMT offers a range of products like Foods, Non-Foods (FMCG) and General Merchandise & Apparel. See Fig 1. For FY16, sales were from Mah. (62.6%), Guj. (18.8%), Telangana (10.15%) and Kar. (6.14%). DMT opened its first store in Mumbai, Mah. in 2002. By Jan 2017, they had 118 stores and retail area of 35.9 lakh sq.ft, located across 45 cities in Mah. (59), Guj. (27), Telangana (13), Kar. (7), AP (4), MP (3), Chhattisgarh (1), NCR (1), Daman (1) and Raj. (2). DMT will expand store network in south & west India, and follows a cluster-based expansion. Leadership is Ignatius Noronha (MD), Ramakant Baheti (CFO), Udaya Yarlagadda (COO Retail). DMT operates and manages all its stores. They operate mostly on an ownership model (incl. long-term lease, with lease period over 30 years and building is owned by the company). DMT opens new stores using a cluster approach on the basis of adjacencies and focuses on an efficient supply chain, targeting densely-populated residential areas with middle class consumers. It operates distribution & packing centers that form the supply chain backbone for stores. They have 22 dist. centers and 6 pack. centers in Mah., Guj., Telangana and Kar. DMT’s approach is to retail quality goods at competitive prices. The majority of products stocked are everyday basic products rather than discretionary items. They minimize operating costs by procuring goods directly from vendors /manufacturers, having an efficient distribution system, minimize inventory build-up, and good store operations. DMT is piloting a project to open delivery centers or pick-up points in catchment areas where it has a store, for online customers. The 150-250 sq. ft. centers named “D’Mart Ready” and will be package pick-up points for eCommerce. DMT plans to add 60% more store space in 3 years, about 21 lakh sq. ft. by FY20. A high proportion of DMT staff are employees on contract. As of Dec 2016, they had only 4,738 full-time employees compared to a high number of employees on contract. The grey market premium for the IPO is about Rs. 227-228. This is a positive. A personal visit to the store was interesting. There were discounts on most products, and on some very good deals. The store location was good, and it was in a busy area. The parking space was ample for customers. There were a range of products under various categories, and in one section DMT had its own private label products with brand names like “D Homes” and “D Premia”. One had to search a little to find shop assistants. There were long queues, even though there were many cashiers counters, indicating popularity at 9.30 pm on a weekday. Overall the experience was good because of the location and deals. While organized retail, primarily brick & mortar, has been in India for more than two decades, its contribution to total retail is still low at 9% (USD 55 bn.) as of 2016, a modest increase from around 7% in 2012. This is expected to become 12% (USD 115 bn.) by FY20. Share of urban retail is expected to grow from 49% in FY16 to 52% in FY20 due to increasing urbanization, a higher urban household income, rural distress due to erratic monsoons and increasing penetration of organized retail in urban centers. Currently, the food and groceries (F&G) segment constitutes a majority share of retail (67%). According to Technopak, F&G will have a share of 66% in 2020. Apparel & accessories and consumer electronics categories account for another 8% and 6% of the the retail market. 16 Indian states contribute 85% of the total retail spend. Retail opportunity in three south states – Kar., AP and Telangana is currently USD 100 bn. According to Technopak, these three south states will witness robust growth. Mah. with 19% and Gujarat will grow steadily. Footwear has the highest penetration in organised retail at 40%; apparel & accessories, jewellery and CDIT have penetrations of 22%, 27% and 25%, resp. whereas F&G has just 3%. At present, the organized general merchandise players in India occupy around 40-45 million sq. ft. area. This requirement of retail space is estimated to grow to 60-65 mn. sq. ft. by 2020. Supermarkets have been observed to garner higher levels of productivity amongst the general merchandise focused formats. The store productivity of a supermarket is typically 20-25% higher than that of a hypermarket. Though the efficiencies are higher for supermarkets, the margins are lower as compared to hypermarkets due to F&G category accounting for a greater portion of the product mix, in which the margins are lower as compared to other non-FMCG categories. We can see in Exhibit 2 that DMT has superior sales psf. The profit drivers of this industry are 1) Growth of Private Label 2) Optimum Store Size and 3) Growth in Food Processing. Organized retail at a national level opened up only 10-15 years ago in India. On introduction, there were worries that a lot of labor intensive small retail businesses will be affected, so it will have negative social impact. However quite quickly we saw that 1) the sector has taken off rapidly and consumer habits have changed fast 2) small retail has not been much affected 3) political opposition has eased. However there are still restrictions on Walmart or other MNC chains with multiple brand retail business directly entering India without local partners. Market shares – Per reports, in F&G, Future group holds the largest market share with 13% followed by D’Mart at 10% and Reliance at 8%. Together, they contribute 31% of F&G segment. Additionally, the overall organised retail market in India is $60 billion in size. With DMT revenue for FY16 = Rs. 8,606 cr., DMT has a 2.11% in the total organized retail market. DMT’s revenues, EBITDA and PAT have grown at 40.3%, 45.5% and 51.6% CAGR from FY12-16, see Fig 3. (FY17 data is a projection of 9M FY17 financials). Thus revenue & PAT growth is good. The EPS has risen sharply in the last 5 years. This is excellent. DMT has positive cash from operations, see Fig 4, but it has been investing into fresh capacities and hence the company has negative FCF. DMT has an ROE of 21% and ROCE of 23.7% for FY16 which is excellent. DMT has not declared dividend in the last 5 years though the promoter has 91.4% stake. The firm has instead reinvested funds generated into capacity expansion. DMT has good margins. The PAT margin for FY16 stood at 3.7% and for 9M FY17 at 4.4%. The margins will improve as the company reduces debt. DMT has a bank balance of Rs. 351 cr. which translates into Rs. 5.6 as cash/share which is low. So cash is being managed efficiently. We benchmark DMT against other retail majors and global retail giant Walmart. See Fig 5. PE for DMT appears average compared to listed Indian retail firms. (TTM is trailing 12 months). However it is high as Trent and Shoppers Stop are recovering from losses till 2 years ago. DMT has witnessed excellent PAT growth compared to peers in the last few years. The 3 year PAT growth over 50% makes it the leader. The D/E ratio at 0.74 is moderate. This will fall after the IPO and so it’s a positive. The inventory turnover ratio at 14.2 times makes DMT leader on this parameter too. The ratio indicates how quickly inventory is sold / rotated. The return ratios are best in the industry. Majority of the retail players are stressed. DMT is good at offering value retail to the cost conscious consumers. The consumption story in India is robust with a rising aspirational urban middle class. This sector has potential. DMT has taken up its footprint expansion using a distinct store acquisition strategy and ownership model. Business has grown rapidly in recent years, and there is ample opportunity in current presence states in West & South, as well as growth in Central, North & East regions. DMT as high operating efficiencies and a lean cost structure through stringent inventory management and good IT systems. DMT has a strong track record of growth and profitability. DMT enjoys a strong promoter background and an experienced & entrepreneurial management team and high of employee ownership. DMT can aspire for high valuations given that they are growing steadily, profitably and organically. It may soon reduce debt, and has a sustainable business model. The IPO is a fresh issue of shares. Hence the promoters aren’t cashing out, this is positive. With just 9% penetration in retail, the organized sector has massive room to grow. The company has been conservatively managed financially with a D/E of 0.74 this year. The valuations look expensive in terms of P/B ratio. However DMT is able to ask for a premium because of its leadership position. Warren Buffet sold off his stake in global retail leader Walmart last quarter. This is partially due to fierce competition from eCommerce, like Amazon. However USA is at a very different stage of development compared to India. Organized retail dominates there; it is at an early stage of penetration here. eCommerce is well established there; it is at a nascent mostly PE stage here. Having said this, well-funded eCommerce firms are offering good discounts and rapid delivery in urban regions thus grabbing volumes and market share, and changing buying habits. In many pockets in India real estate development is restricted by hidden forces like local politician fiefdoms, administrative permit raj and corruption. Any of the retail firms can be victims of this. Future Retail is a fierce competitor with all India presence, and both organic and acquisition based growth with brands like EasyDay, Nilgiris and Heritage retail. Reliance Retail too is a very big player with Reliance Fresh and vertical chains. Several MNC firms are keen to enter. With stake of 82% post IPO, the promoters will need to reduce to 75% within 3 years of listing. Organized retail in India has a good future, and will offer consumers better services and range of products. We can certainly expect multi-year growth, new formats and innovation. DMT has managed current operations and growth very well, and built up a loyal customer base. It has good performance metrics and should grow well organically. The IPO is going to benefit the company in terms of premium inflows that will help reduce debt and grow the network/ operations. Repayment of debt will reduce finance costs. DMT has a professional management team, a respected investor promoter and clear vision and growth strategies which are likely to take the company to new heights in the near future. At a current P/E of 39.9, the valuations are good, considering that DMT is the leader in its segment. This IPO offering is rated BUY, and investors can invest with a 2 year perspective. This document has been prepared by JainMatrix Investments Bangalore (JM), and is meant for use by the recipient only as information and is not for circulation. This document is not to be reported or copied or made available to others without prior permission of JM. It should not be considered or taken as an offer to sell or a solicitation to buy or sell any security. The information contained in this report has been obtained from sources that are considered to be reliable. However, JM has not independently verified the accuracy or completeness of the same. Punit Jain intends to apply for this IPO in the Retail category. Other than this, JM has no known financial interests in DMT or any group company. Neither JM nor any of its affiliates, its directors or its employees accepts any responsibility of whatsoever nature for the information, statements and opinion given, made available or expressed herein or for any omission therein. Recipients of this report should be aware that past performance is not necessarily a guide to future performance and value of investments can go down as well. The suitability or otherwise of any investments will depend upon the recipient’s particular circumstances and, in case of doubt, advice should be sought from an Investment Advisor. Punit Jain is a registered Research Analyst under SEBI (Research Analysts) Regulations, 2014. JM has been publishing equity research reports since Nov 2012. Any questions should be directed to the director of JainMatrix Investments at punit.jain@jainmatrix.com.